Your Office 365 environment is a complex maze of services accessed by all stake holders in your organization based on what business functions they are part of. From an IT management perspective, an IT administrator will need to make a choice on what level of visibility the company requires when users engage with Office 365. For example, a simple Dashboard overview of how your office 365 is being accessed may be enough at a top level. However, for important security related questions such as ‘who has access to what’ you will need a series of Office 365 security reports that can report about your Exchange Online, SharePoint online, mobile devices etc. In short, you will need to take control of all user touch points in Office 365. If your organization is fairly large (say more than 1000 users), you will need to constantly, proactively manage your Office 365. 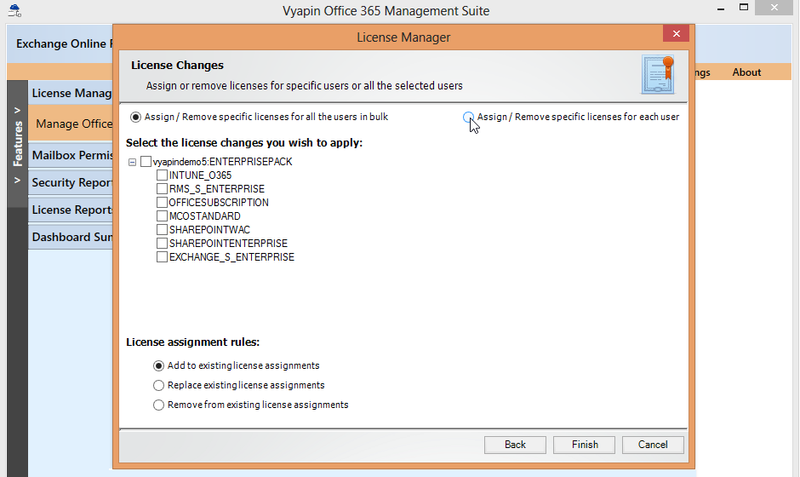 For example, you will constantly have the need to report on usage of licenses by recycling or reusing these licenses when users get provisioned and deprovisioned. Keeping all these in mind, Vyapin Office 365 reporting tool provides the most powerful set of reports that serve the different needs of Office 365 administration at different times, whether it is monitoring the health or reviewing security or provisioning users and groups or just plain vanilla administrative tasks. Given below are some of the most important Office 365 reports, the ones that you will always be in need of. 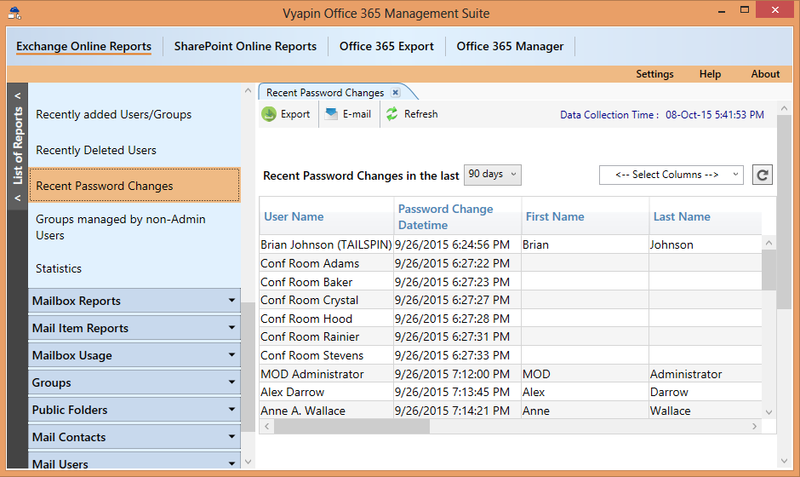 These reports give you a quick summary of what is there and happening in your Office 365 environment. When the time comes for Office 365 Compliance and Security Audit, administrators and managers are hounded by questions on who has access to what, what activities users performed in the recent past and whether sufficient controls have been put in place at important and sensitive touch points in Office 365. In Office 365, end users tend to share their mailboxes and data for genuine business reasons, however, without paying attention to the security implications. Data security breaches happen due to a constant pile up of accesses granted without security policies in place. The most recurring causes are group memberships, sharing of mailboxes and Public Folders, external sharing of One Drive content and so on. 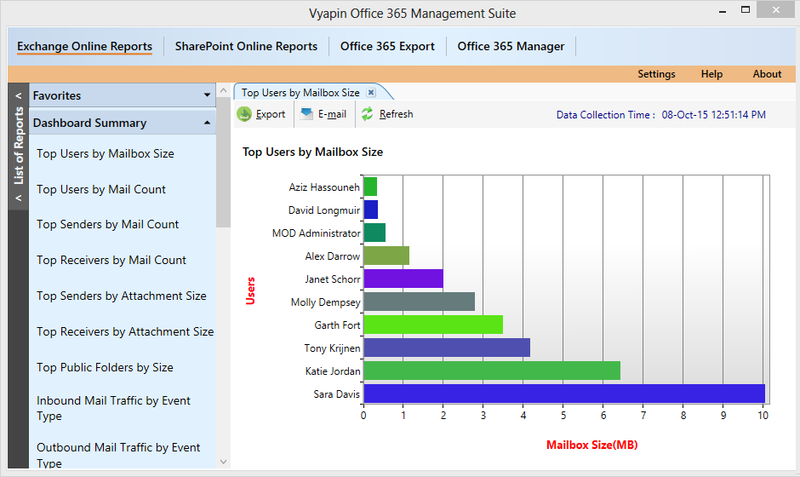 The ‘Security Impact Report’ in Vyapin Office 365 Management Suite is the most powerful and actionable report that lets administrators review what levels of access users have across different assets in Office 365 in order to study the impact of user accesses on security. This report shows who has access to public folders, One Drive content and shared mailboxes along with other related information such as Group memberships and administration roles. These reports provide you information with the overall configuration and health of your Office 365 environment. Reports on Users and their mailboxes, Groups and their memberships, Mobile devices, Mailbox Permissions, Mailbox traffic and usage etc. These are reports that you will have a regular need for, say on a weekly or monthly basis, and assist you in performing your Office 365 management tasks effectively.